The Constitution of the United States of America is an interesting document. That it is a fixed document is part of the point. Unfortunately, the English language isn't as stable as paper. It's inevitable that the document will be unintelligible to the majority of the population within a few hundred years*. Imagine what people would make of it written in Chaucer's English? Unless the language is updated to convey the appropriate meaning, it's possible to envisage a time when America worships a piece of old brown paper, doesn't know why, and locks up people who say bad things about the shade of brown. Now, obviously, you keep the original. BUT, it is self- evidently a good idea to at least have a plan for conveying the meaning of the document to future peoples. If current trends are anything to go by, the whole thing will be translated in to a series of amusing animated cat gifs. Chaucerian and Shakespearian English are still (with a little effort) perfectly comprehensible to a large proportion of English people (as opposed to mere "speakers" of "English"). Magna Carta is still a "live" legal document, and that's written in Latin. Some of England's most important documents were written in Chaucer's (or earlier) English. Somehow, we seem to manage OK. The bibles, however, are a very different matter. I preferred the "Not" bible. Well, doing the Constitution in Linear B would be best, as then no one would understand it. Like the Bible. The invention of dictionaries has done a lot to stabilize a language. "Fad" words get removed due to obsolescence about as often as they get added due to popularity. But the rest of the language holds pretty steady, at least partly because of pronunciation guides, in those same dictionaries. Yes, but how long before Disney buys out the franchise ... ? I'm not seeing Bert. 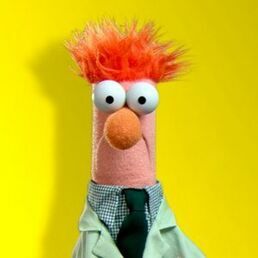 I'm seeing Beaker. Over the long haul, there is no way that any particular document written by a people frozen in time can anticipate the issues of peoples hundreds of years into the future. Constitutions should be highly-moderated wikidocuments. Given the Orwellian nature that politics can take, it almost doesn't seem to matter whether words are changed, or the meaning of words changes. Which does not mean, though, that one should go gently into that good night. Imagine a boot, stamping on the 4th amendment - Forever. Imagine the ACLU camping on your doorstep - Forever. It'll be purple flashing elephants next. Take more water with it. How can any other way of reading it ensure limited government? If a key point of a Constitution is to limit what kinds of laws may be passed, how can it be safe to read it any other way? Any constitutional process that simultaneously allows to both create, and repeal something like Prohibition, to have equal protection under the law and progressive income taxes, to have drug laws and a right to privacy, is pretty freaking flexible already. Be thankful. Yes, but does it say anything about the current Bert/Beaker controversy?